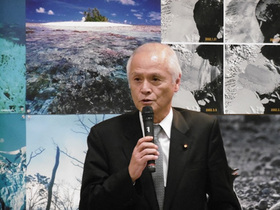 Minister Yamamoto exchanged views with environment organization including NGOs about effort to achieve Decarbonized societies toward the goal of the Paris Agreement. 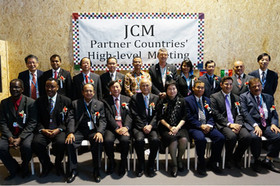 "The 4th JCM Partner Countries' High-level Meeting" was held in Japan pavilion of the COP22. 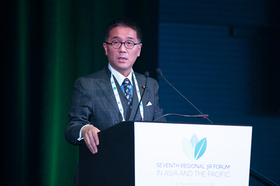 Minister Yamamoto shared the progress of the diffusion of leading low-carbon technologies with the representatives of the 16 Joint Crediting Mechanism (JCM) partner countries. 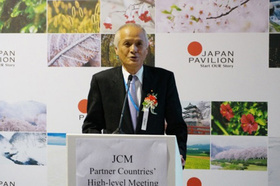 The government of Japan will continuously facilitate the JCM as a means to contribute to GHG emission reductions or removals. 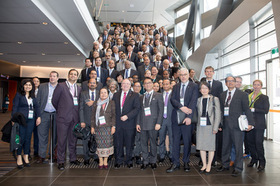 A group photo of Minister Yamamoto and representatives from 16 JCM partner countries. 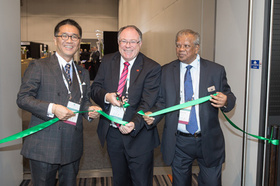 Tadahiko Ito,State Minister, attended the 7th Regional 3R Forum in Asia and the Pacific in Adelaide, Australia. 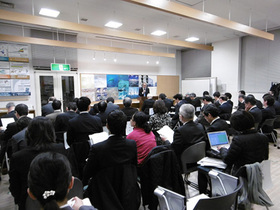 Participants, comprising high-level government officials from Asia-Pacific discussed the promotion of 3R toward the establishment of the Sound Material-Cycle society.